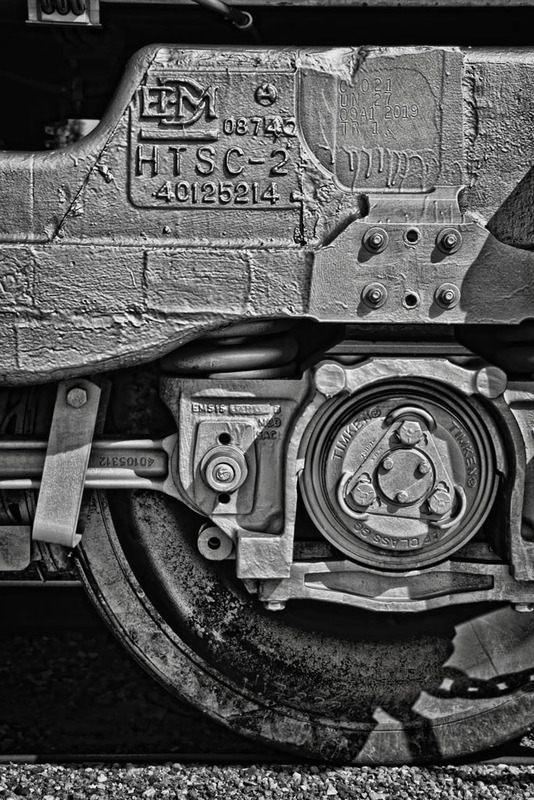 Ronald Olsen of Coventry, Rhode Island, has won first prize in the Center for Railroad Photography & Art’s 2013 John E. Gruber Photography Awards Program. 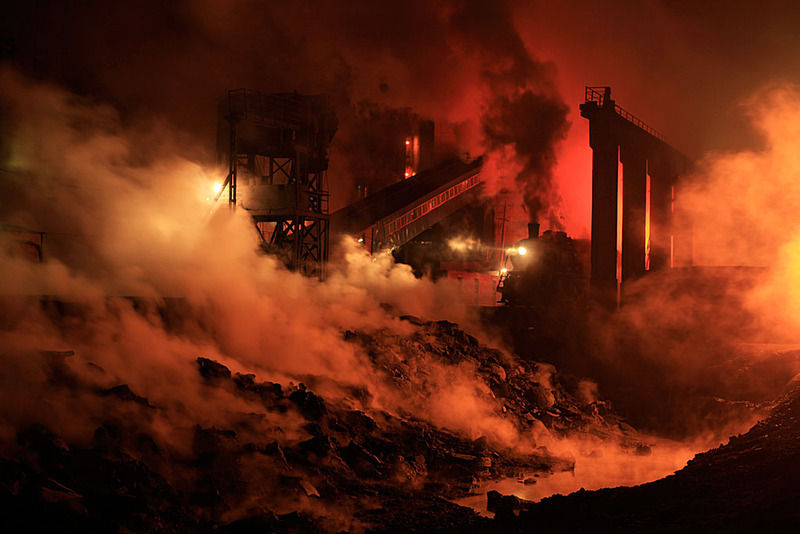 Olsen has been photographing nocturnal steam operations in China since 2001, and his view from the Beitai Steelworks in Liaoning Province combines ambient lighting and industrial conditions in an unusual and very dramatic way. Second prize went to Daryl-Ann Saunders, Brooklyn, New York, while Nick D’Amato of Denver, Colorado, took third prize. Twenty-five additional photographers—hailing from three continents—received recognition in the “Judges Also Liked” category. The eighty-six photographers who entered the awards program provided a very diverse range of images. Nearly every entrant submitted one or more photographs containing the “wow” factor and having strong merit in the contest. It made a powerful case for “Creative Images,” the theme of the 11th annual awards program. The Center expanded the notion of creativity in the program by opening submissions to include all forms of digital manipulations (so long as they were disclosed). The collection as a whole would make for a stunning gallery exhibit or book. While the judges struggled with the arduous task of picking only three images for the first, second, and third place winners, they saw no losers among the entries. First place receives $1,000 in cash and a printer donated by Canon, a Pixma Pro-10 (maximum print size of 13 by 19 inches, using archival pigment inks); second place, $500 cash and from Lowepro, camera backpack Photo Sport 200 AW; and third prize, $250 cash and from Lowepro, a Toploader Pro 65 AW camera bag and lens case. An anonymous donor provided funds for the cash prizes. Complimentary one-year memberships to the Center go to all who received honorable mentions. The California State Railroad Museum in Sacramento will host an exhibition with most of the photographs. The Center will publish the winners and a selection of images the Judges Also Liked in issue no. 35 of Railroad Heritage (December 2013), as will Railfan & Railroad in a future issue. Thanks go to Mel Patrick who helped promote the awards and encouraged photographers to send entries. Deep in the Beitai Steelworks of China’s Liaoning Province, a 2-8-2 SY-class steam locomotive brings a cut of “thimble” cars of liquid slag to the dumpsite on January 26, 2012. A timely gust of wind blew the steam off to the left of the frame, allowing for a clear view of the locomotive. 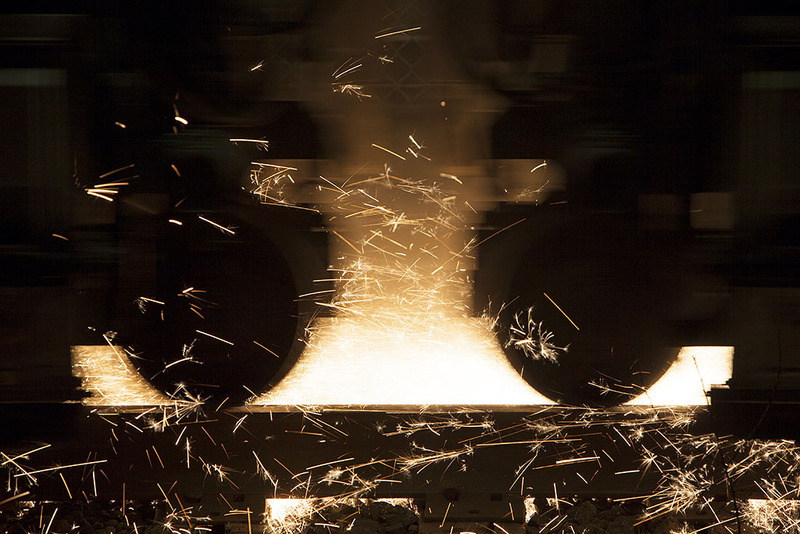 Beitai Steel has since ceased using steam locomotives. Ronald Olsen has been making night photographs of steam railroading in China since 2001, during which time he has made more than twenty trips to country. He has traveled extensively in search of steam by train, bus, taxi, bicycle, horse cart, and on foot. 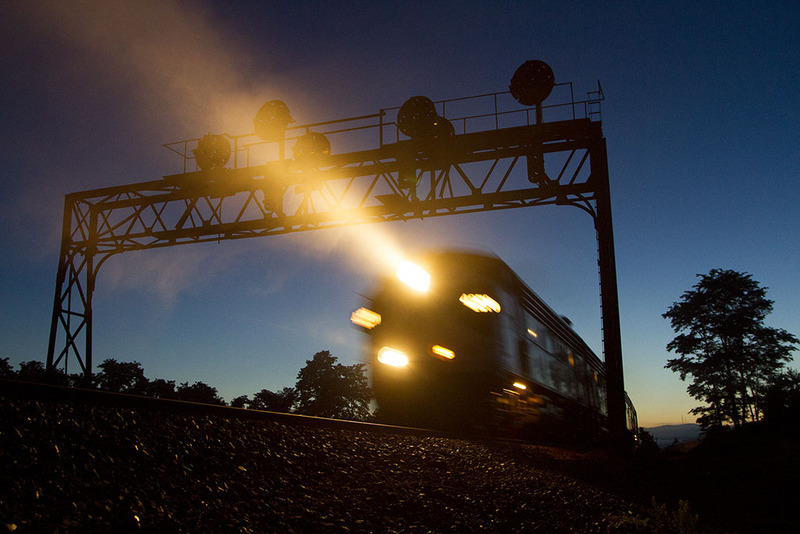 Olsen uses ambient light, flashbulbs, and synchronized electronic flash for his night work. He has been using digital cameras since 2005, but he has also used medium and large format film cameras. He has spent most of his career in nursing, but he currently works for the Valley Railroad Company in Essex, Connecticut. Olsen lives in Coventry, Rhode Island, with his wife, Cindy Lou Chapman, and a small flock of chickens. Daryl-Ann Saunders, of Brooklyn, New York, is a commercial and fine art photographer. 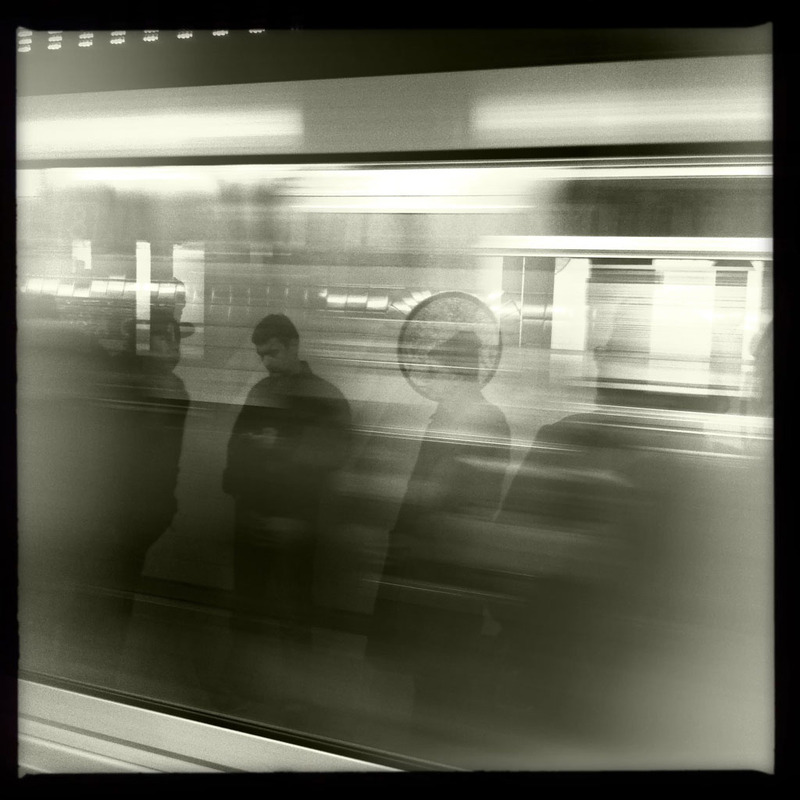 She says, “I have always been captivated by the travel allure of trains and, to me, subways are their urban equivalent. 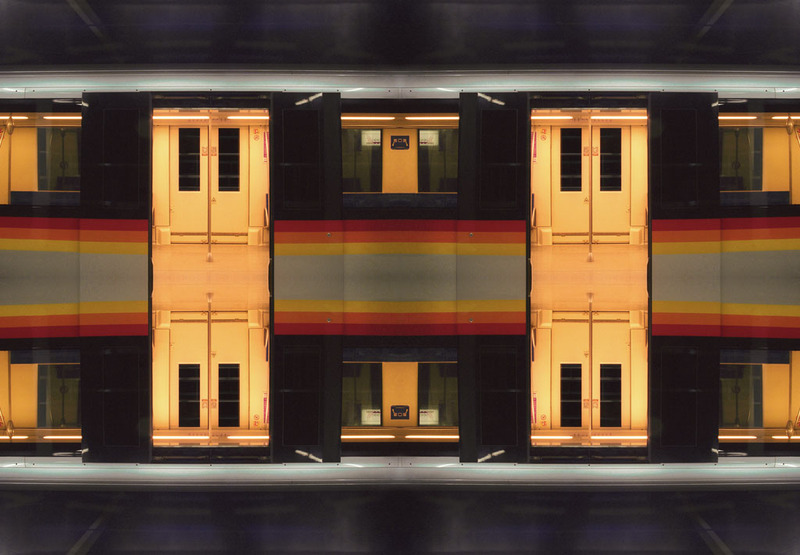 I travel to different cities in order to explore the relationships specific to those transit systems and the communities in which they reside.” Her award-winning work is regularly displayed in solo and group exhibitions. It is also held in corporate (Pfizer, General Electric, etc.) as well as private collections. You can see more of her work at www.dasfineart.com and www.dasaunders.com. 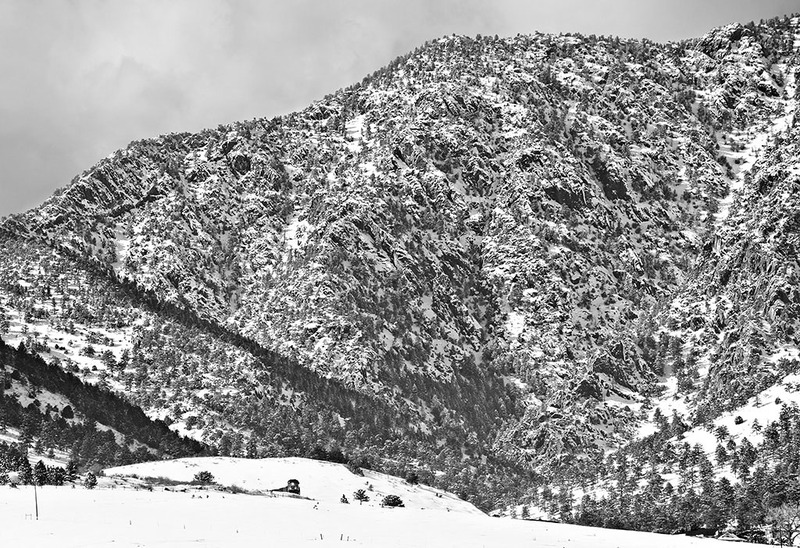 Union Pacific eastbound loaded coal train descending the Front Range of the Rocky Mountains near Arvada, Colorado, on February 5, 2012. The train is near the siding of Clay and the Big Ten curve of the former Denver & Rio Grande Western’s Moffat Tunnel Route. Nick D’Amato recently moved to Denver, Colorado, after spending six years in North Carolina earning a Ph.D. degree in Cancer Biology. When not in the lab, he enjoys a wide range of photography including transportation and travel subjects, concerts, and landscapes, and his wife, Valerie, frequently accompanies him on his outings. 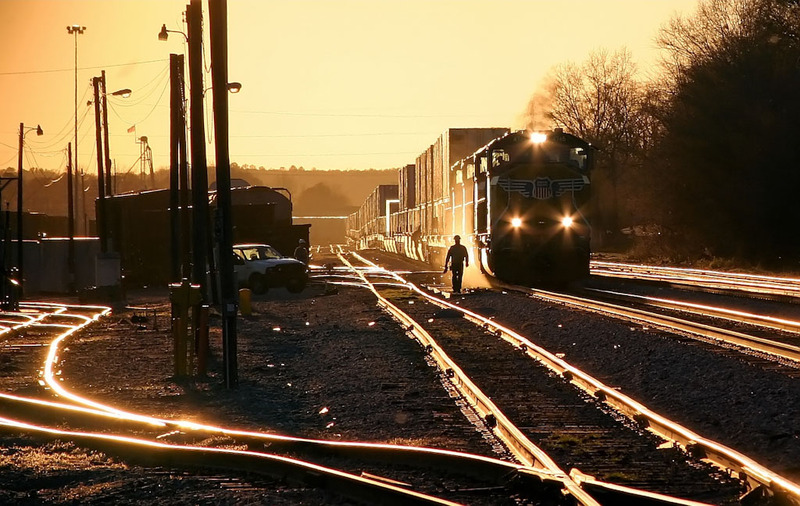 D’Amato’s photographs have won numerous awards throughout the southeast, and he has authored several articles for regional and national railroading magazines. You can see more of his work at www.diamonddphotography.com. 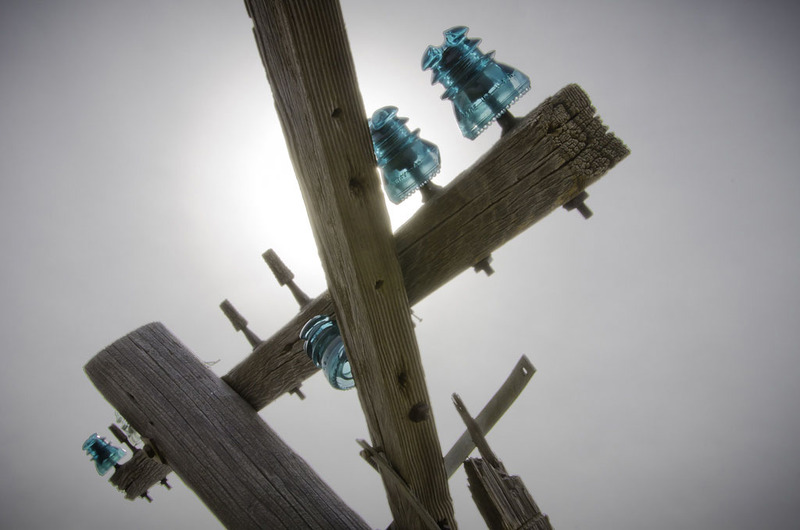 Telephone pole with glass insulators along the Kyle Railroad on the former Rock Island main line at Brewster, Kansas, in March 2013. Union Pacific's Jim Coker has just wrapped up some business on the radio as his train passes an auto train going the opposite direction on June 2, 2011, during a trip behind steam locomotive no. 844. 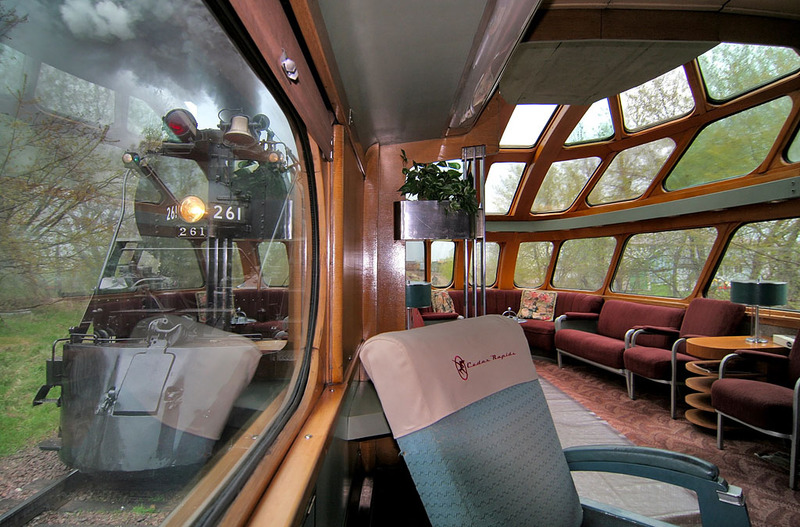 The photographer took the image from inside the passenger compartment through the door under employee supervision. Former Milwaukee Road steam locomotive no. 261 powers a freight train out of the yard past the "Cedar Rapids" Skytop observation car on May 10, 2008. The photographer thanks fellow photographer Mitch Goldman for loaning his 10-20mm lens for this once-in-a-lifetime shot. Sparks fly from Loram rail grinder RGS 3 (LMIX-606) as it works the Canadian National Halton Subdivision adjacent to the GO Transit station in Brampton, Ontario, on May 2, 2013. RER B train en route to Roissy Charles de Gaulle airport as it passes through Le Bourget in the northern suburbs of Paris, France, on a January 2012 evening. 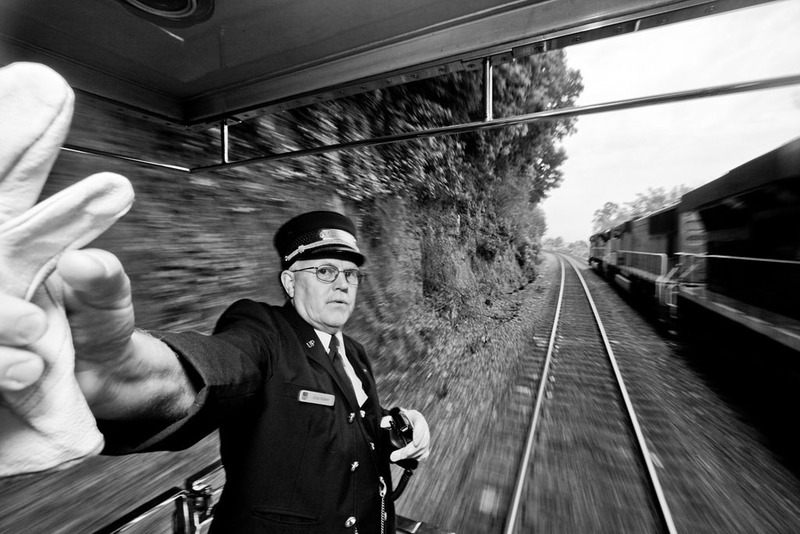 The photographer is a train driver in France and to him, "trains are synonymous with shakings, jumpings, etc. This was picture was done at slow speed and using a derivative of the classical panning technique. 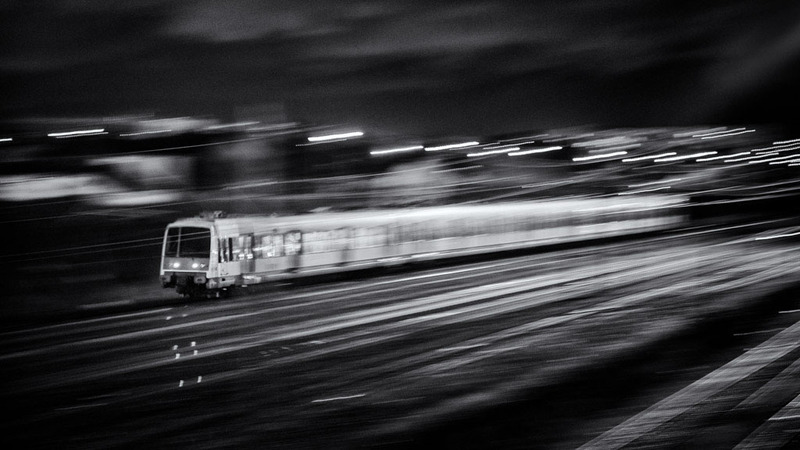 As the train goes away from a 45-degree angle, a small part of it is sharp." He used Nik Silver Efex Pro 2 software to convert image from color to B&W after initial processing in Adobe Lightroom. 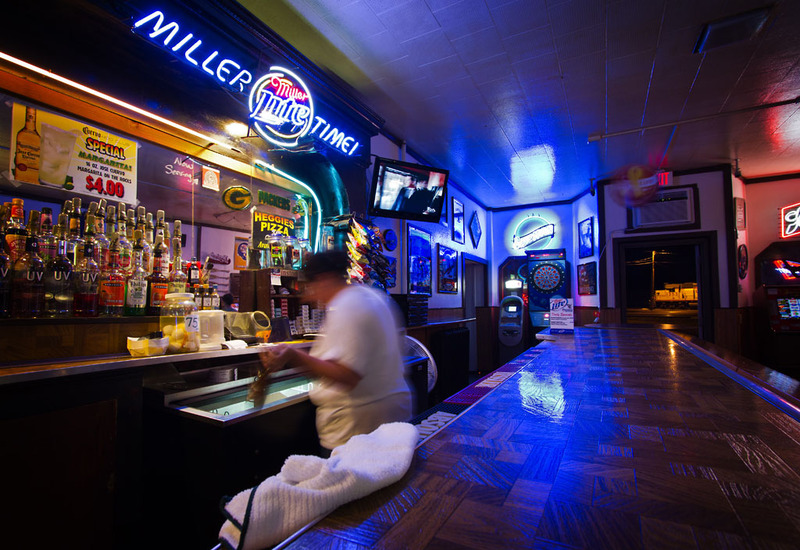 The bartender reaches into the cooler for a cold one at the "400" Club in Altoona, Wisconsin, named after the famous Chicago and North Western passenger train that used to pass right by the front door. Former Denver & Rio Grande Western 2-8-2 steam locomotive no. 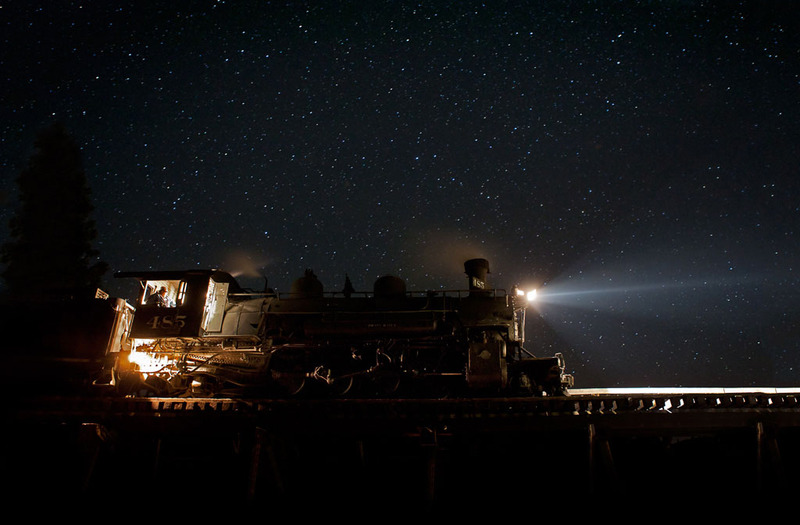 485 pauses on a trestle near Cumbres, Colorado, on the Cumbres & Toltec Scenic Railroad on the starry night of September 21, 2011. The photographer blended two exposures, one of the locomotive and one of the sky, to balance the lighting. He also used the Content Aware command in Photoshop, along with manual touch-up, to expand the composition at left and bottom. Finally, he used Neat Image to remove noise from the image and applied a modest amount of sharpening. 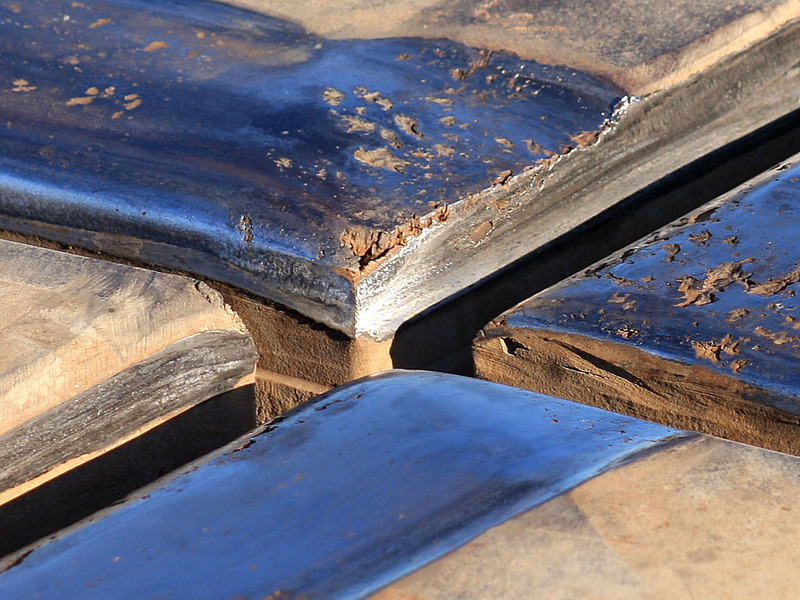 Polished steel rails at Joliet, Illinois, reflect a clear blue sky on August 21, 2011. The location is Union Station at the crossing of the BNSF Railway's former Santa Fe main line and Metra's former Rock Island line. 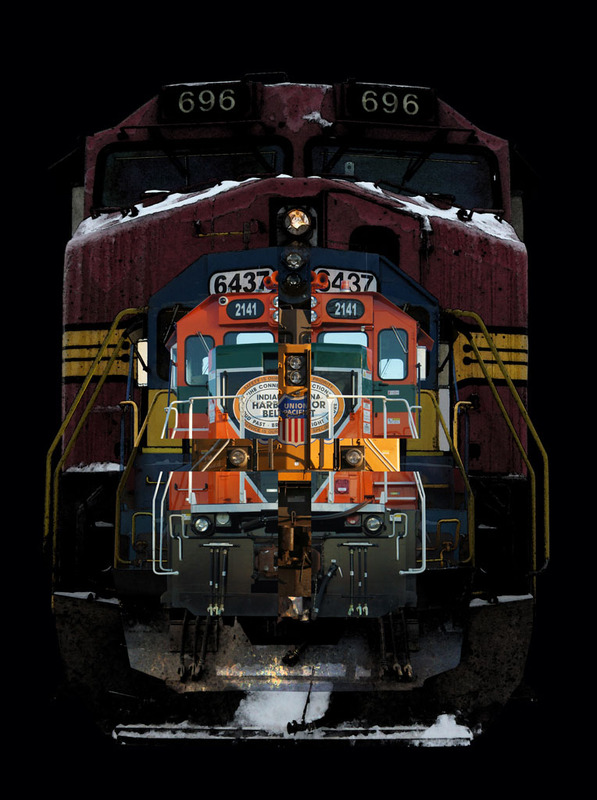 Composite of four locomotives from images taken over a twelve-month period in 2011 and 2012. The subjects are a BNSF Dash-9, a Union Pacific AC4400, an Iowa, Chicago & Eastern SD40-2, and an Indiana Harbor Belt genset. The photographer removed the backgrounds from the original images and replaced them with black, then used various Photoshop filters including watercolor and desaturation in the blending process. "This image explores my interest in comparative juxtaposition and sequential overlay," the photographer said. 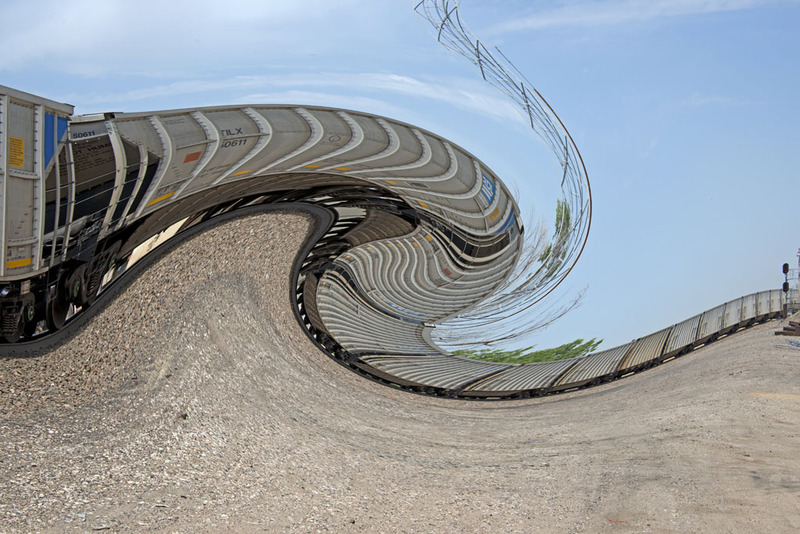 "In this composite image, the story focuses on the interconnected relationship of transfer railroads." 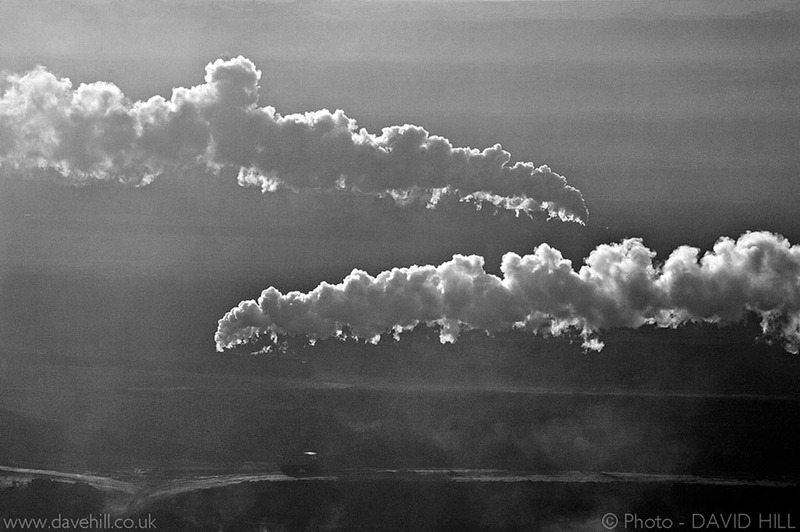 On a different level: steam locomotives working in the open cast coal mine of Sandaoling in the far west of China. December 2012. © David Hill. 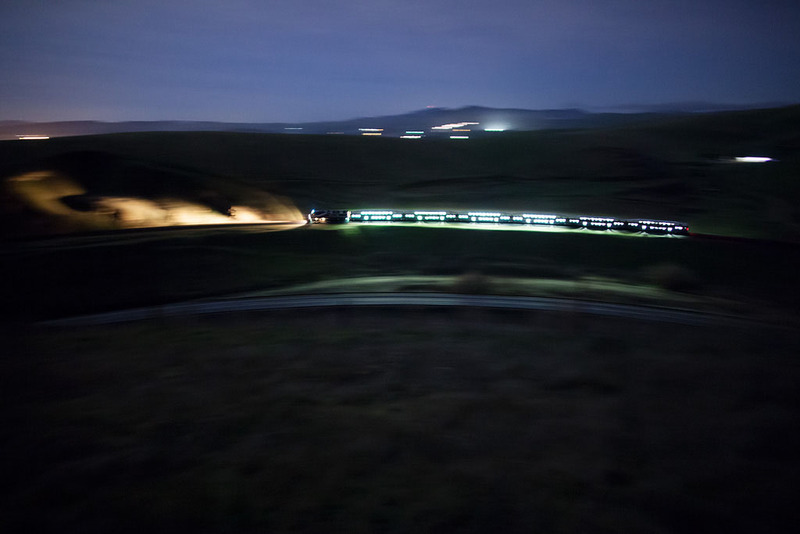 Westbound Altamont Commuter Express train on the west slope of Altamont Pass near Livermore, California, in the predawn of January 29, 2013. 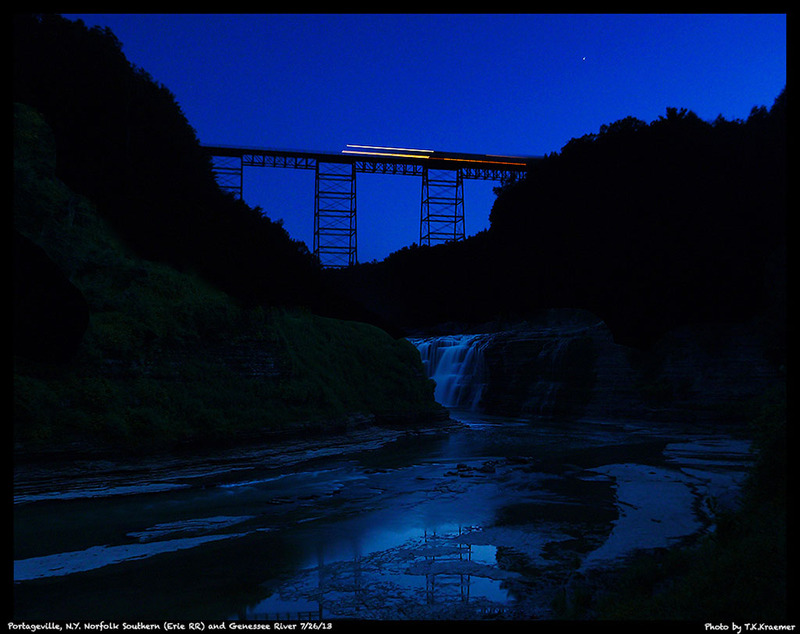 Norfolk Southern freight train crossing the Genessee River at Portageville, New York, during the "blue hour" of July 26, 2013. The photographed combined two exposures, made just moments apart, one optimized for the scene and another for the streaks of light, to achieve the final image. 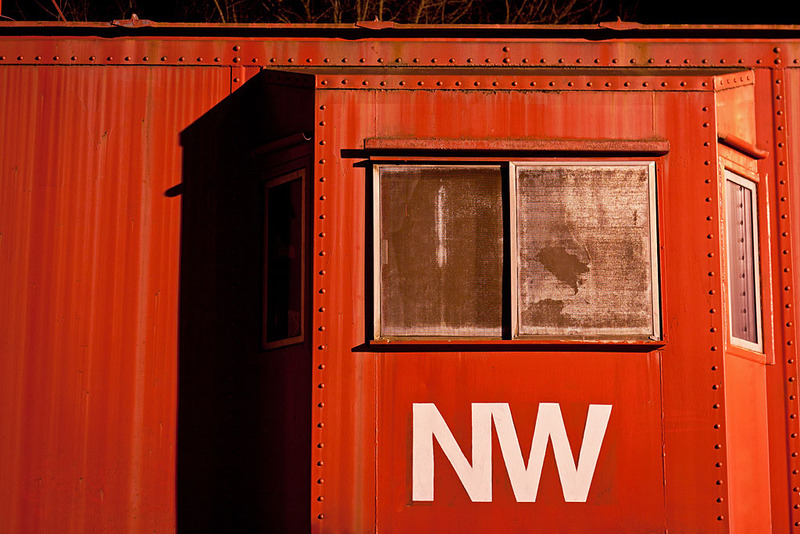 Norfolk & Western caboose in Central, South Carolina, illuminated by a solitary street light on the cold winter night of February 2, 2012. 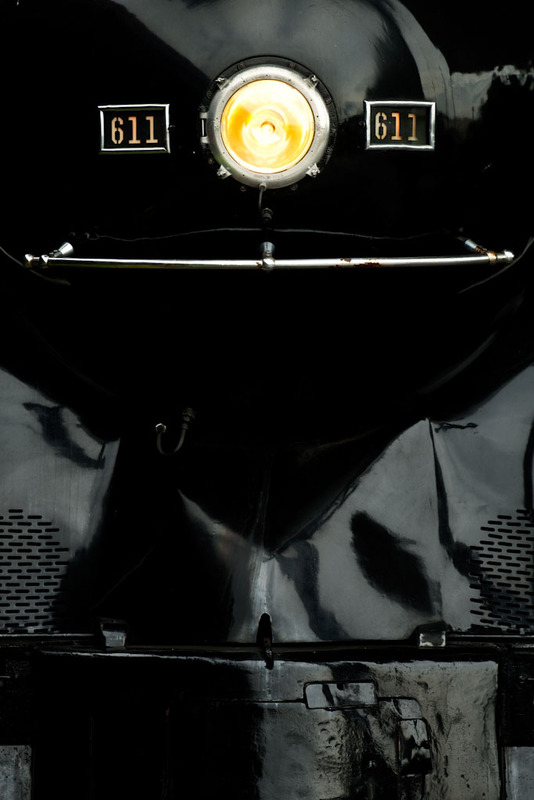 Steamtown's former Canadian National locomotive no. 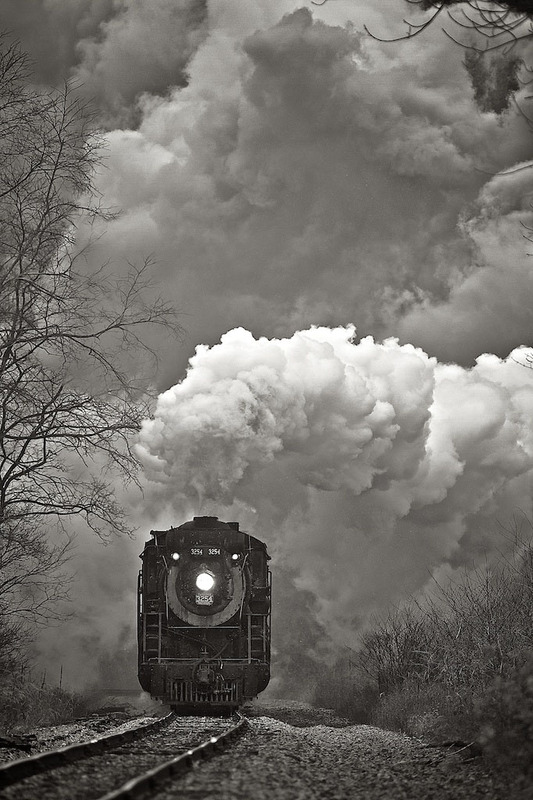 3254 being "chased" by its own steam plume due to a strong tail wind blowing up the Roaring Brook gorge as the locomotive charges up the 1.5 percent grade to Moscow, Pennsylvania, on November 27, 2010. Engineer Aaron Stout and Fireman Jack Emerick III are in charge of the excursion train. 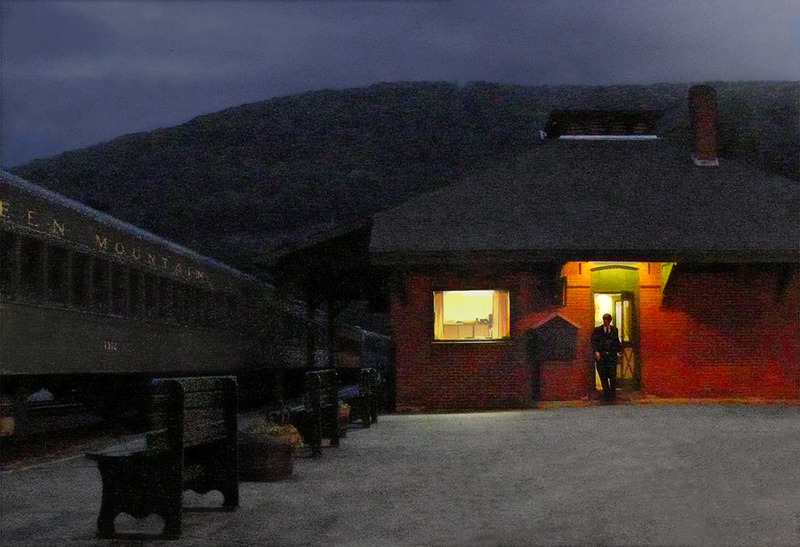 After the arrival of the last train of the day, the trainmaster emerges from the Green Mountain Railroad station in Bellows Falls, Vermont, on October 14, 2008. The photographer started with a high-ISO image that contained quite a bit of digital noise and then applied moderate noise reduction, cloned out an area of new blacktop, darkened the evening sky, removed a radio antennae and power lines from the station, and slightly enhanced local contrast. 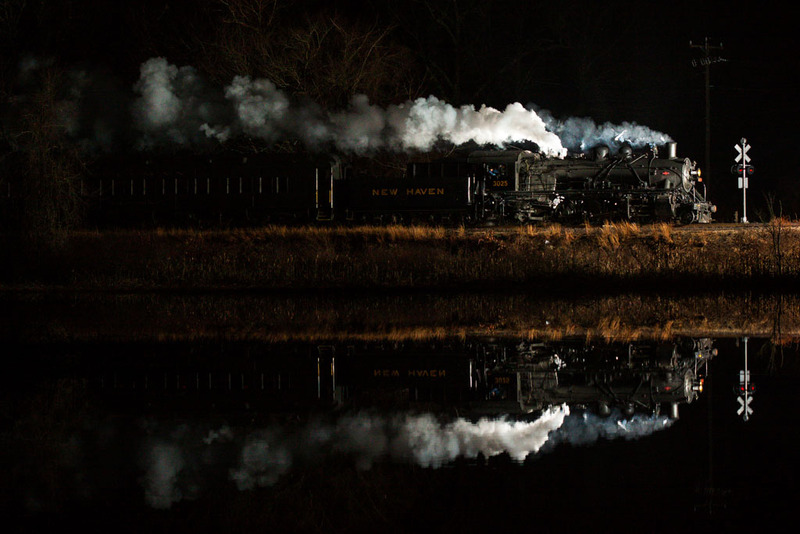 The Valley Railroad's Essex Steam Train is reflected by the Connecticut River at Pratt Cove in Deep River, Connecticut, on December 18, 2012. The photographer, drawing inspiration from O. Winston Link, Richard Steinheimer, and Mel Patrick, lit the scene with three electronic flashes. He used Adobe Lightroom to remove one small streetlight from the among the tree branches at upper left and its reflection in the water. Norfolk Southern train no. 226 (with Union Pacific power) on the main line fuel rack at Meridian, Mississippi, on February ‎2, ‎2008. The only processing performed was cropping and slight saturation and contrast adjustments. The main line fueling rack and all of the trackage on the left have since been removed from the yard, but train no. 226 still operates daily through town. "Nose to Nose." Norfolk & Western Railway J-class steam locomotive no. 611 at the Roanoke Museum of Transportation on July 19, 2011. 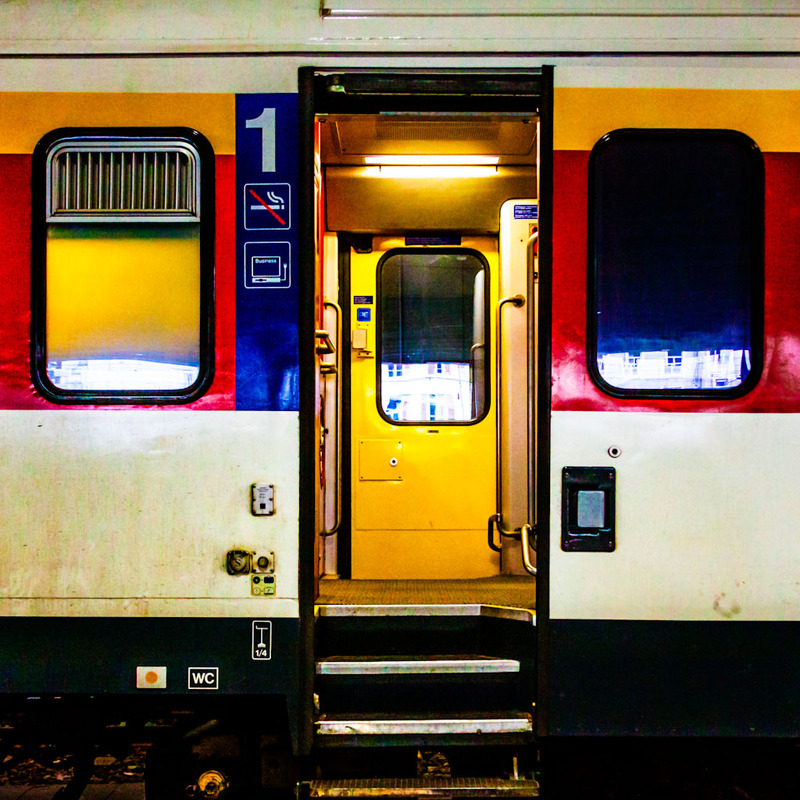 "Come on in..." A Swiss commuter rail car awaits passengers at the Basel SBB Railway Station in Basel, Switzerland, on March 7, 2012. The photographer used Adobe Photoshop to increase color saturation and contrast, add noise, and crop the image to a square format. Norfolk Southern's business train passing under an iconic former Pennsylvania Railroad signal bridge at Tipton, Pennsylvania, on July 26, 2013, as the headlights shine through a light morning mist. The train was making a deadhead move from Croxton, New Jersey, to Altoona, Pennsylvania. 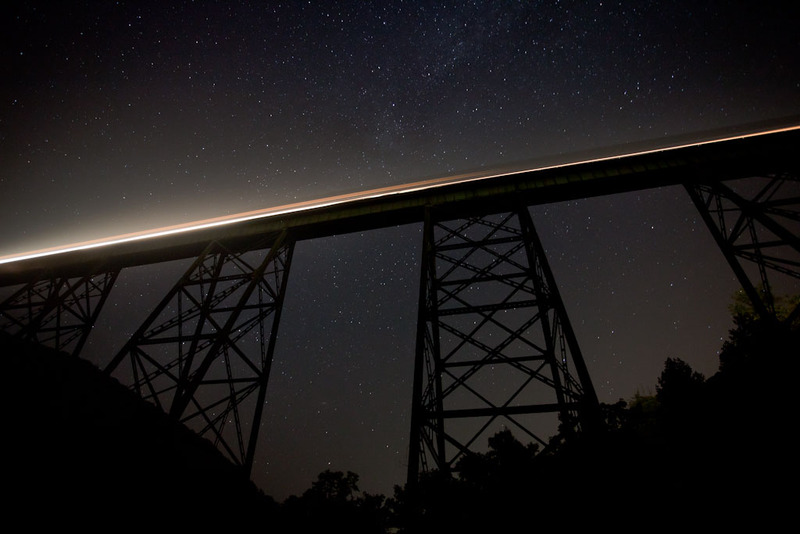 Southbound train streaking across the Copper Creek Viaduct near Clinchport, Virginia, on the clear night of August 7, 2010. The Milky Way can be seen behind the center of the bridge. See more of Bryan Pleasant's photography at www.bpleasantphotography.smugmug.com. "Snake Train." Empty coal hoppers on the BNSF Railway at Kennesburg, Colorado, on June 22, 2013. The photographer used Photoshop to create the swirl effect. He said, "When I took the image, I knew that I would do something, but I did not know what. Later, I thought that turning the image into a snake would be fantastic." "Steel Wheel." One of the wheels of the truck assembly of a new BNSF Railway SD70ACe locomotive at Railroad Days in Galesburg, Illinois, on June 27, 2009. The photographer used Photoshop to enhance contrast and sharpening and to add slight vignetting. 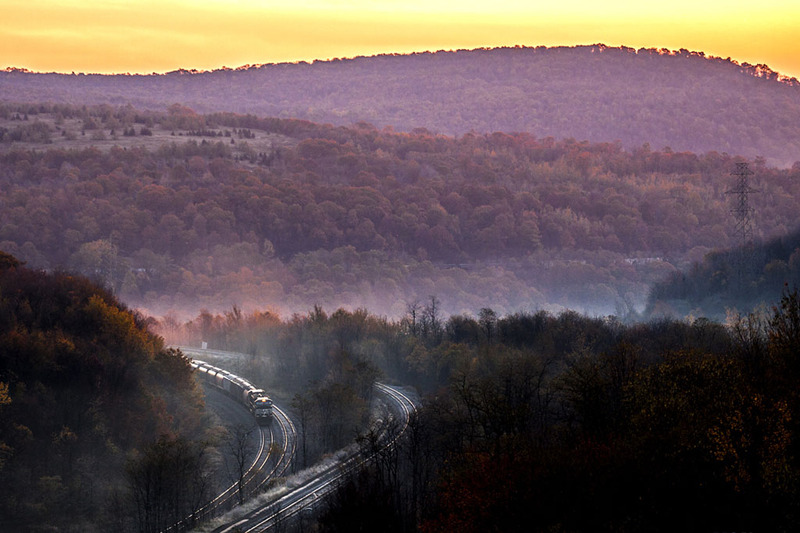 Westbound Norfolk Southern freight train approaching the summit of the Alleghenies at Gallitzin, Pennsylvania, on the morning of October 23, 2011. This the former Pennsylvania Railroad's main line; the famous Horseshoe Curve is just to the left. The photographer used Photoshop to make minor enhancements to color saturation, to lighten the shadows, and to increase contrast. Commuters, reflected on the side of blurred cars, show little interest in the arrival of a 4/5/6 Line subway train at the 77th Street Station in New York City on February 29, 2012. The photographer used an iPhone 4 with the Hipstamatic app using filters "Melodie Lens" and "Claunch 72 Monochrome film." Photoshop was used to reduce noise and increase file size. "Late Commute." 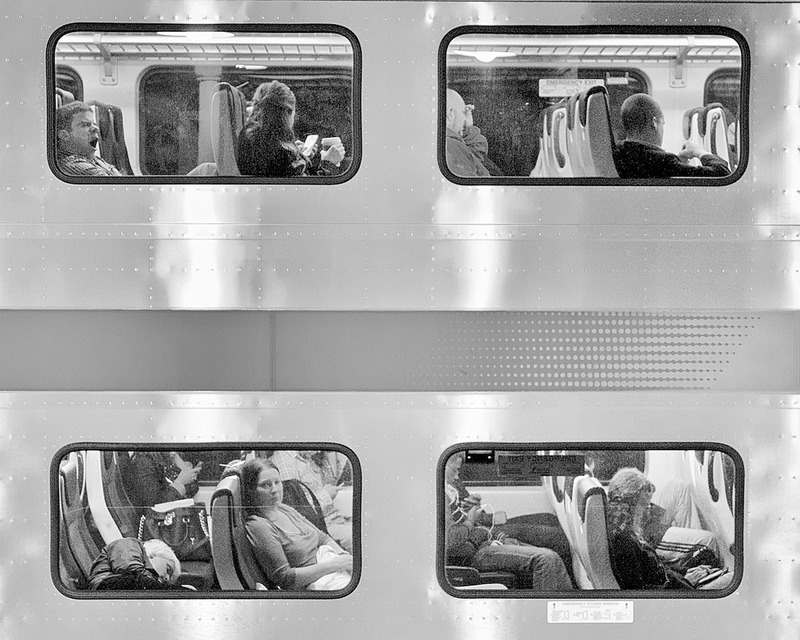 Commuters framed in the windows of an NJ Transit double-deck passenger car at the Broad Street Station in Newark, New Jersey, on May 2, 2012. The photographer used NIK Silver Efex 2 Pro to convert the color digital image to black-and-white.